Shisen-sho(in Korean, Sa-Cheon-Sung 사천성) is a board game that originated in Japan, which is popular in Korea as well. The game is played on a rectangular game board with N \times M cells, and various tiles are placed on some of the cells. The object of the game is to remove all of the tiles from the board, and the only way to remove tiles from the board is to remove one pair of matching tiles connected by a valid path. Throughout the game play, the player continues to remove pairs of tiles from the board, pair by pair. The path connects two matching tiles. The path consists of at most three axis-aligned line segments, starting and ending at the center of two tiles. 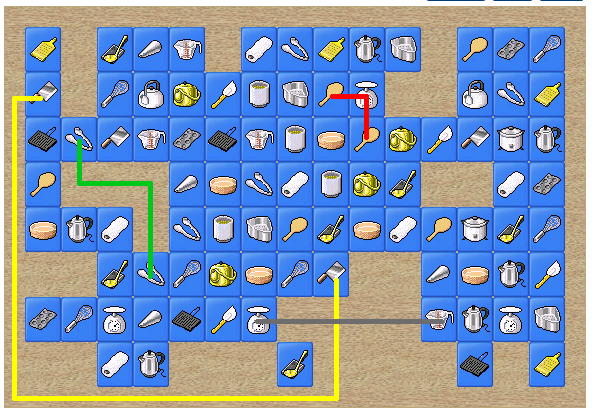 The path should not touch or pass through any cells containing tiles, except the starting and ending tiles. For example, the above figure shows a possible game board and some valid and invalid paths. The green path is a valid one. The gray path is invalid, because it connects two different tiles. The yellow path is invalid, because it contains 4 line segments. The red path is invalid, because it passes through a cell that is not empty. We want to assign difficulty levels to a set of Shisen-sho game boards. The difficulty level is defined by the number of distinct pairs of tiles that can be removed from the board with a single move. A single move means removing a pair of tiles connected by a valid path. Given a game board, Write a program to compute the difficulty level of the board. Your program is to read from standard input. The input consists of T test cases. The number of test cases T is given in the first line of the input. The first line of each test case contains two integers H and W\;(3 \le H, W \le 50). H lines will follow, each of which contains W characters where each character denotes a cell in the game board. A period(.) denotes an empty cell, and lower and upper alphabet characters denote different kind of tiles. For all test cases, the first row, first column, last row, and last column of the game board will be empty. Your program is to write to standard output. Print exactly one line for each test case. The line should contain an integer indicating the number of distinct pair of tiles that can be removed from the board with a single move. 안녕하세요 출력에서 single move 의 해석이 어떻게 될까요? 한번도 꺽지 않고 직선으로 연결을 의미하는걸까요..
문제를 잘 읽어보시면 설명이 있습니다. A single move means removing a pair of tiles connected by a valid path. valid path에 의해 이어진 타일 한 쌍을 제거하는 것이라고 하네요. 이거 풀때 일반적으로 알려진 알고리즘 쓸게 있나요? 연결 가능한 타일의 종류가 2개 이상일수 있는 예제도 포함인가요? 으억. 그런데 실패했어요.. 누가 도움좀 부탁드려요. DFS로 풀었네요. 모든 경로를 도느라 효율은 좋지 않지만 소스는 이해하기 쉬운. 이 테스트 케이스도 괜찮습니다. 이 테스트 케이스 답 5 나오는거 맞나요? 위에 sdfsf 님께서 제시하신 입력예도 처리해야 되나요? 문제에는 For all test cases, the first row, first column, last row, and last column of the game board will be empty. 와 같은 이어져 있는 경우에도 답을 처리해야 한다는 예시를 보여주신 것 같습니다. 아넵! 알겠습니다. 그런데 실제 프로그래밍 대회에서두 문제에 명확하게 이런 예외는 없다.. 이런 식으로 제시한다면.. 반드시 그러한 예외입력은 고려할 필요가 없는 것이겠지요? 프로그램 문법상의 문제가 있는지 확인 해 보기 위해 아래와 같은 예제 generator 를 만들어서 사용 해 봤습니다. 처음 input으로 T 값을 넣어주시면 랜덤 field가 생성 될 겁니다. 필요하신 분들 python 3.6 이상 버전으로 돌려서 사용하시길 바래요. field[u]= field[u] + "." + str + "."